There are a number of different ways of measuring retention. For the purposes of this article, we’re going to focus on Snapshot Retention, which shows how well an app is retaining users in the period immediately after they download it. In other words, how many users actually use the app in the days after they installed it. 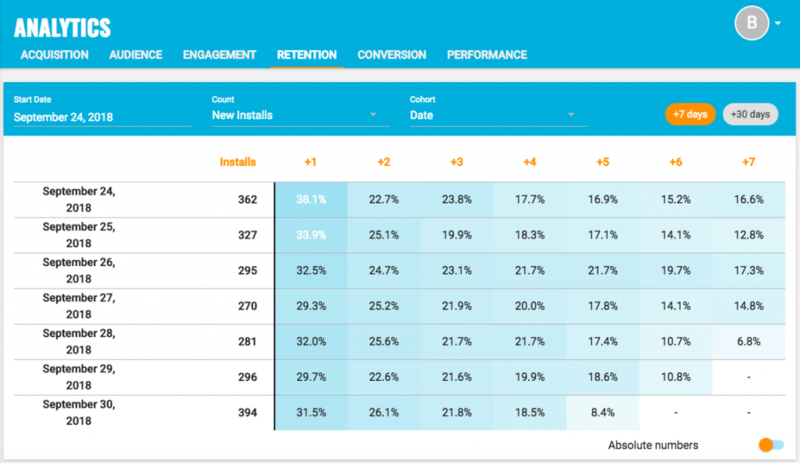 Typically expressed as a percentage and shown as a table, retention answers the question “What percentage of new users are still actively using the app after 7 days or 30 days?” etc. While the overall percentage is important, analytics tools such as Kumulos also then allow you to drill down and see how retention varies between different groups of users (called cohorts) such as country or platform, which can highlight actions to take to improve. For example: if 7 day retention is higher on iOS than Android, then you should check you don’t have any crashes on Android and that the onboarding flow is as straight-forward as in your iOS app. As a typical rule of thumb though, 30% retention at 30 days would be considered good, subject to all of the health warnings above. What cannot be disputed though is that it costs more, a lot more, as much as 700% more to acquire new users than it does to retain existing users. Yet, Bain and Company estimate that just a 5% increase in retention, can result in anything between a 5% to 95% increase in RoI. As your job as a mobile app developer is to deliver the best possible outcome for your clients, while working within their budget constraints, it comes down to simple economics – retaining users costs less and is more effective than acquiring new users. 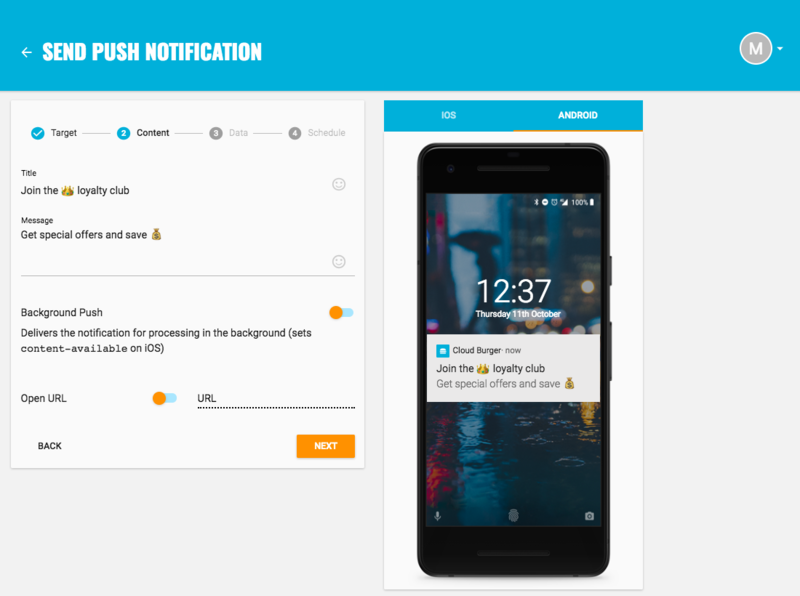 The first way to increase retention with push notifications is to proactively use your retention data to your advantage. Like jokes, when it comes to push notifications, timing is everything! Your retention table will show you when the major drop offs occur. Don’t be disheartened, you now know exactly when users could benefit from a little nudge or reminder to keep using your app and therefore when a push notification will be most effective! 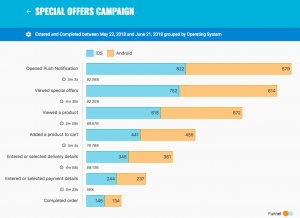 For more hints and tips on how to increase retention with push notifications, see this excellent piece written by Cristina Stefanova from specialist ASO and Mobile App Marketing agency, TheTool. While we have been focussing on Snapshot Retention, in a previous blog post we discussed the different strategies for measuring retention. 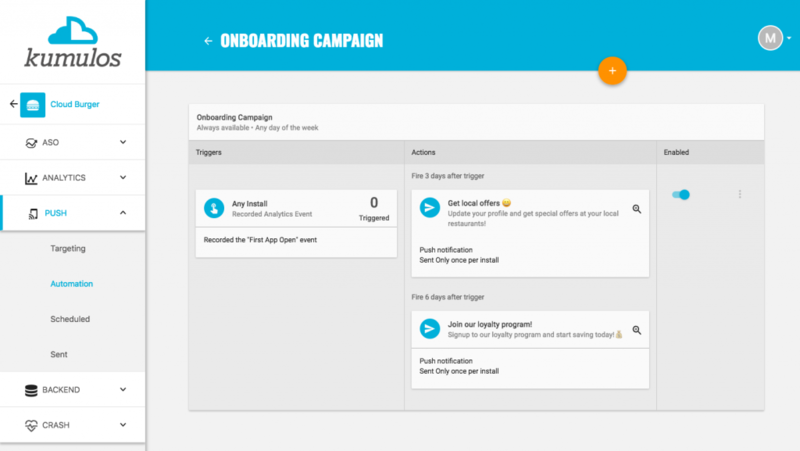 If you want to implement the approaches discussed above in your mobile app, the multi-award-winning Kumulos platform contains all the tools you need to measure and increase retention with push notifications. Request a Demo or signup for a Free 30 Day Trial.